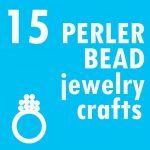 A roundup of 30 amazing perler bead ideas, including crafts, home decor, accessories, and jewelry. 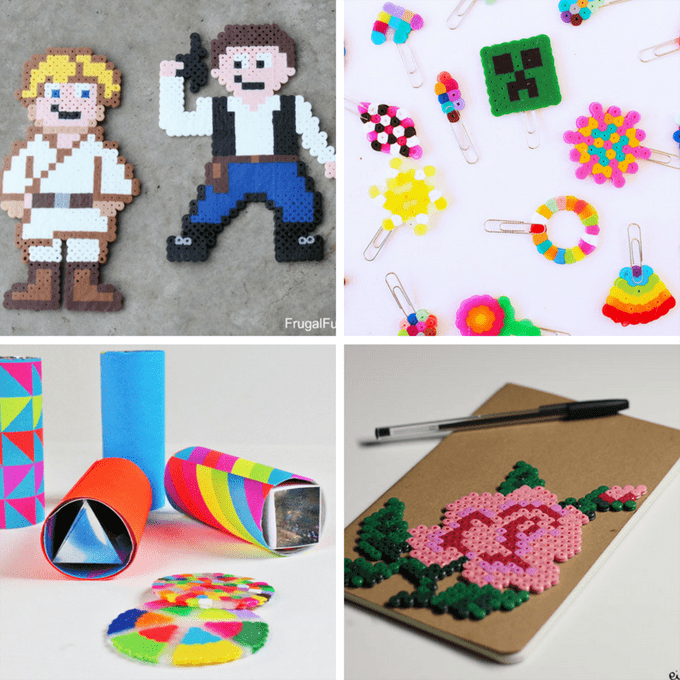 So many perler bead ideas! Aren’t you folks as clever as clever can be, what with all you do with little beads. And here I ruined my daughter’s peace sign when it stuck to the iron. 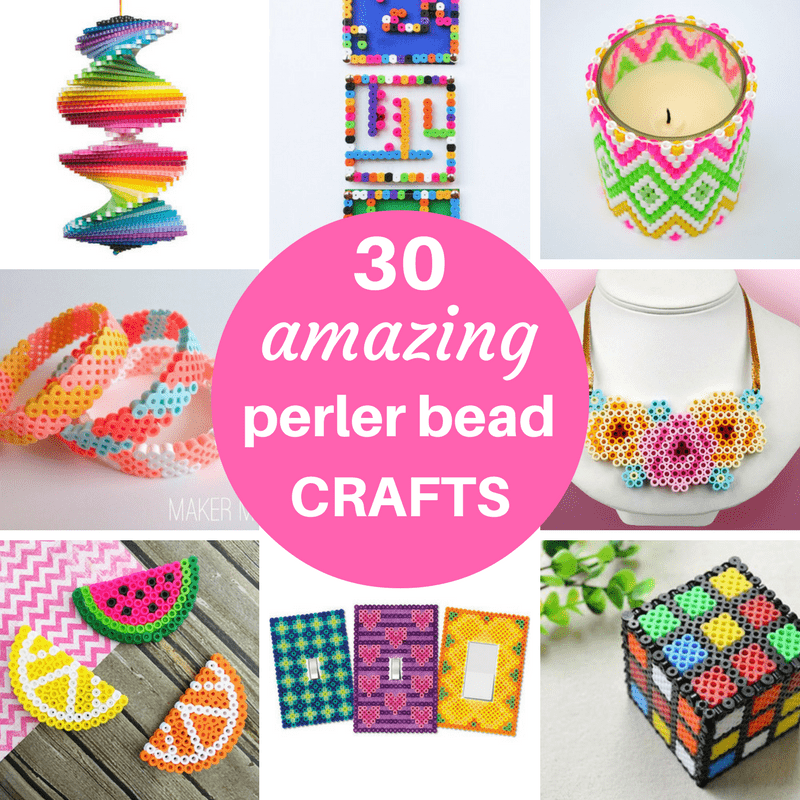 I rounded up 30 amazing perler beads ideas and crafts (or, Hama beads, or melted beads, although not all of these are melted). You can find plenty of Perler beads at amazon (affiliate link) or craft stores. IKEA even sells a huge tub of them for a few dollars. 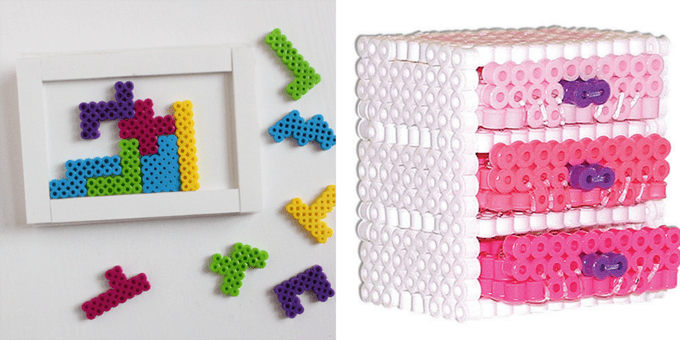 Need more Perler Bead ideas? 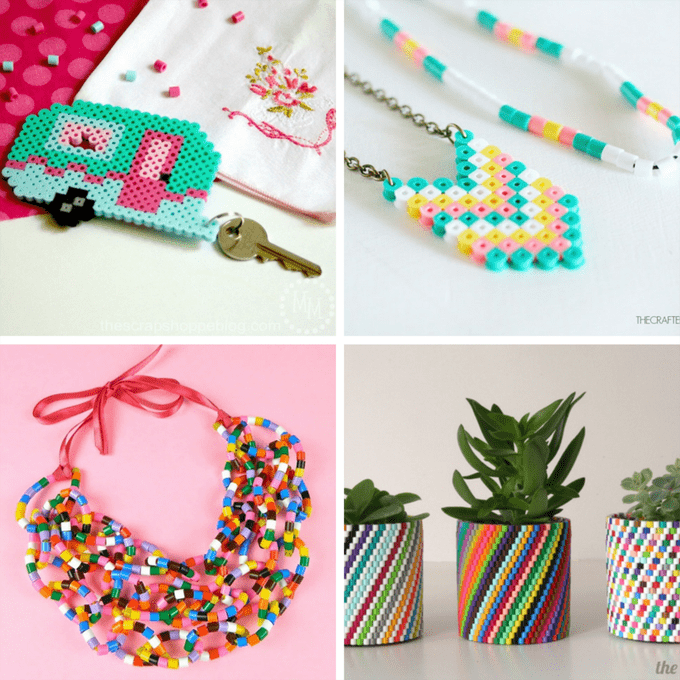 Check out this roundup of 15 perler bead jewelry crafts. Arrange your beads on the pegboard following your pattern. TIP: Use a non-slip mat under your project so you don’t jostle the beads accidentally. Heat a dry iron, set to medium. You may want to place the pegboard on a towel or other material to protect the surface beneath. Place the parchment on top of the beads and move the iron over the beads in a circular motion, checking the beads every few seconds. Let the beads cool a bit and flip over, removing the peg board. Cover with parchment paper and iron for about ten more seconds. Let cool a bit and remove the parchment. So, ready to pull out the perler beads and the iron and get to work? 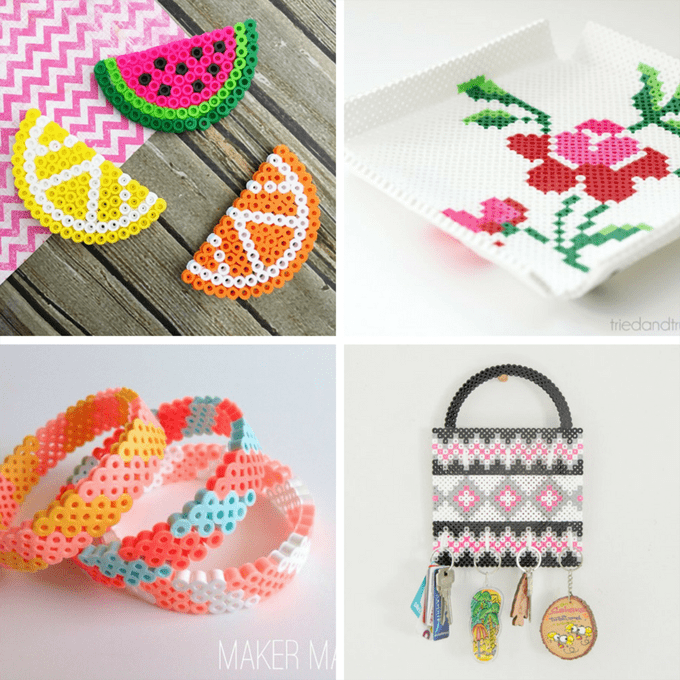 There are plenty of perler bead patterns out there, but I think these shown are some of the best. Make bead magnets at Frugal Mom, Eh! This perler bead tray is gorgeous, from Tried and True. 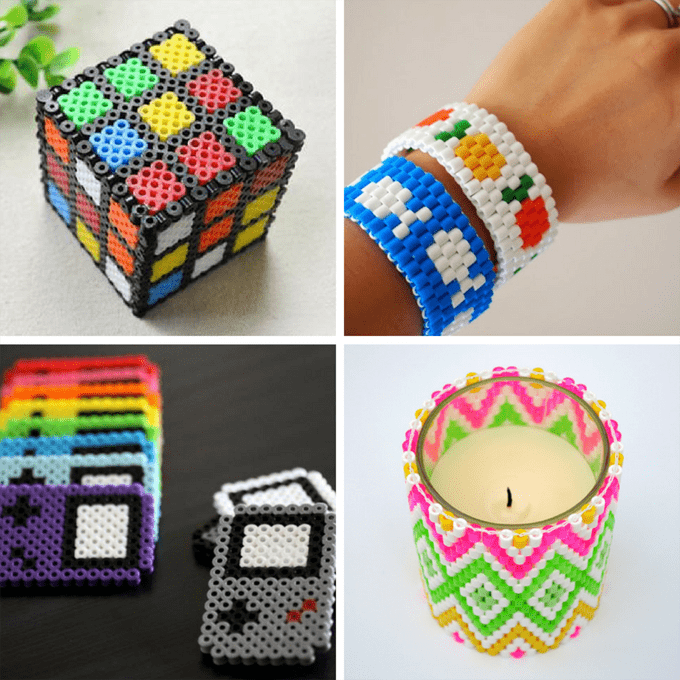 Make perler bead bangles at DIY Candy. Make a bead key hanger at Vikalpah. 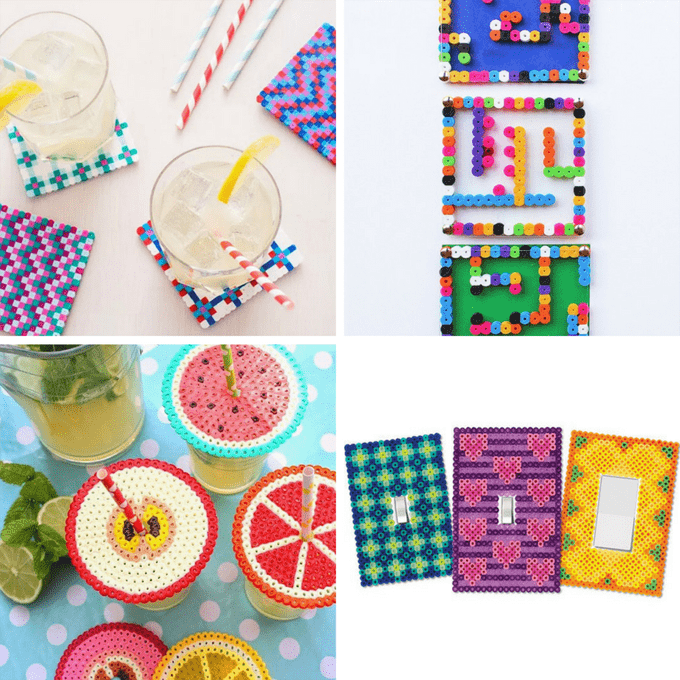 Make coasters at Brit and Co.
Make perler bead mazes at Babble Dabble Do. Make beverage lids at Make. This is one I’ve actually done. 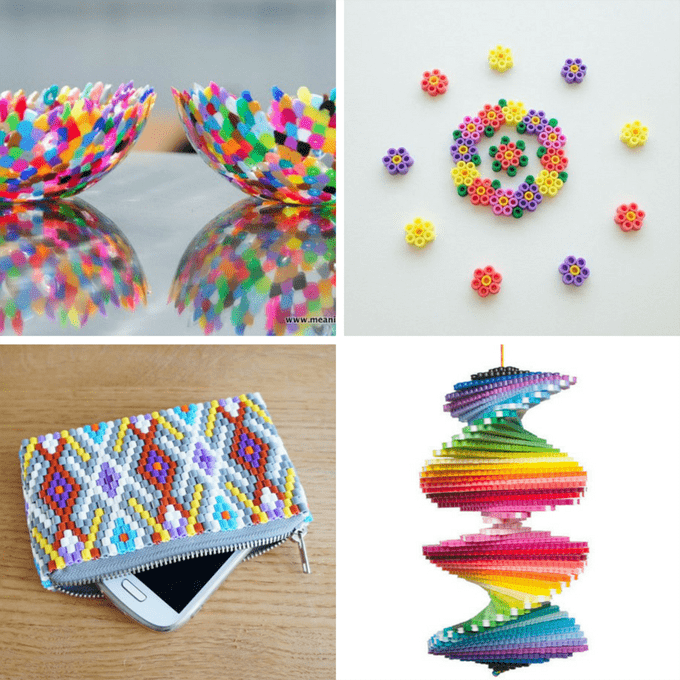 Make a perler bead bowl at Meaningful Mama. Check out this flower wreath by Instagram user bymettes. Make a little purse at Style. Design. Create. Make a rainbow spinner at Perler. Make a retro camper keychain at The Scrap Shoppe Blog. Love these necklaces from The Crafted Sparrow. Or these bead and zip tie necklaces at Make your Mark! Make planters at the 3 Rs blog. Make buttons at Maker Mama. Make these necklaces at Perler. Make perler bead fruit bowls at Vikalpah. Make the alphabet at 1+1+1=1. Find Star Wars patterns at Frugal Fun 4 Boys. Make little bookmarks at Babble Dabble Do. Check out this flower notebook at Eilen Tein. Make a Rubik’s Cube at PandaHall.com. Make stretchy bracelets at Pink Stripey Socks. Make Game Boy magnets at Gadgetsin. Make a candle holder at Minieco.co.uk. Make a puzzle at Rachel Swartley. Make a little dresser at Perler. 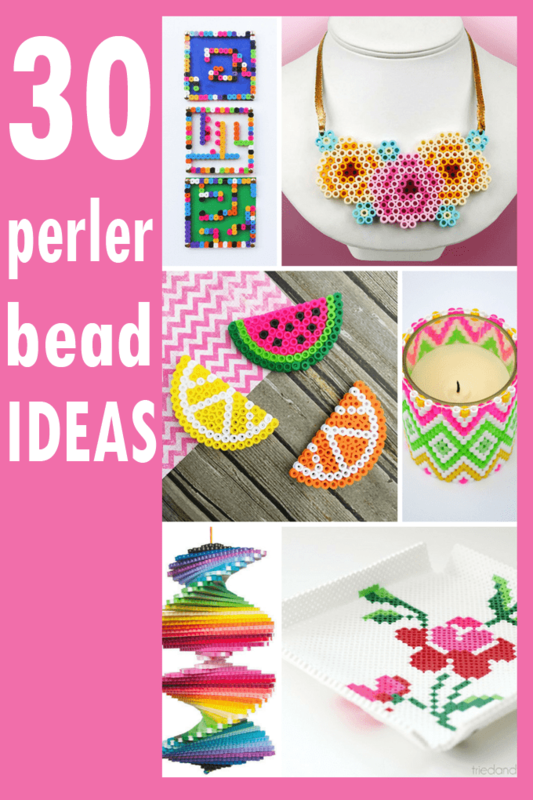 Like this roundup of perler bead ideas?? 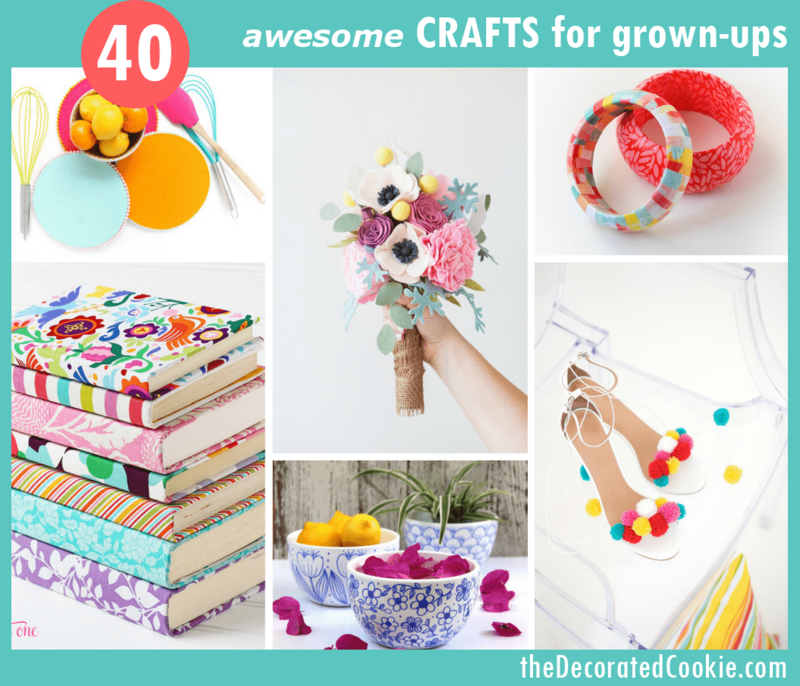 Try this roundup of 30 knitting projects for beginners OR this roundup of 40 crafts for grown-ups. 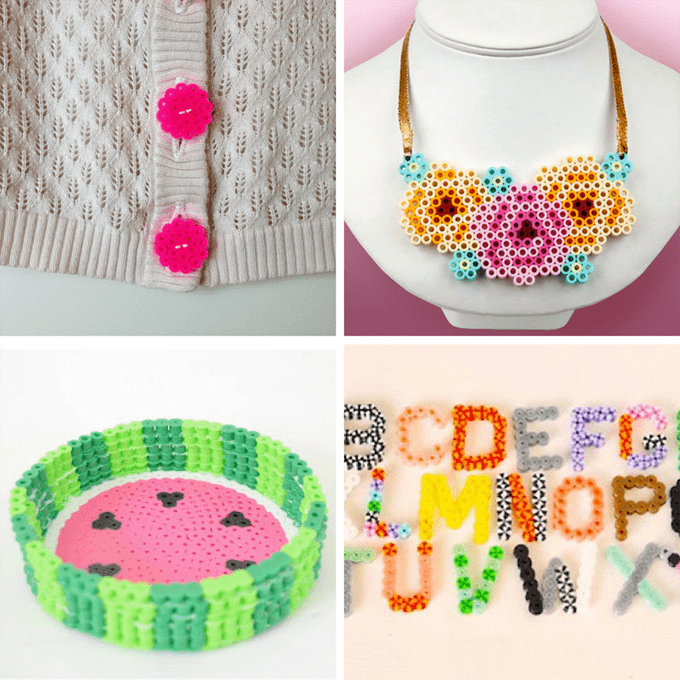 Maybe your next DIY with beads should be necklaces and bracelets with Hama beads and Precious Beads?